What do you do when you arrive in Nice after a great bike ride through the Alps? You take a rest, relax on a terrace and watch the waves of the Mediterranean. Soon you realize... you want more! More mountains, more amazing scenery and more challenge. You take a map of France and start dreaming about the moon landscape of the Mont Ventoux. You look further on the map and see the classic climbs of the Pyrenees. Your finger drifts over the map and your eyes discover wonderful gorges which connect the Mont Ventoux with the Pyrenees. But... where to finish? At the Atlantic Ocean? The Mediterranean? Yes, let's finish in Barcelona after a great loop through the French and Spanish Pyrenees. "La Grande Boucle des Pyrénées" is born. Out of Nice you turn directly inland to the quiet mountains of the Haute Provence. Magnificent scenery. You get excellent views if you cycle along the northern rim of the Grand Canyon du Verdon; one of Europe's most scenic canyons. The Mont Ventoux looms soon above the lavender fields if you head further in Western direction. A rest day is planned at the foot of the Giant of the Provence to get the opportunity to climb the legendary mountain from all sides. The Gorges de l'Ardeche, the Cévennes National Park and Gorges du Tarn bring you to the medieval town of Carcassonne. In one word : "gorgeous". The Pyrenees are waiting. Illustrious names like the Col de Portet d'Aspet, Col d'Aubisque, Col du Tourmalet, Col d'Aspin, Col de Peyresourde and Col du Portillon on the French side. The Puerto del Portalet, Puerto de Catefablo, Port de la Bonaigua and Port de Cantó are some of the climbs on the Spanish side. You cycle over high cols, through deep canyons and beautiful national parks before you drop down to the Mediterranean. The 4th edition of "La Grande Boucle des Pyrénées" starts Thursday May 10th, 2018 in Nice at the Côte d'Azur. The finish lies after 20 days, 1.890 kilometres and a lot of climbs in metropolis of Barcelona. The whole route follows paved, relatively quiet and scenic mountain roads. 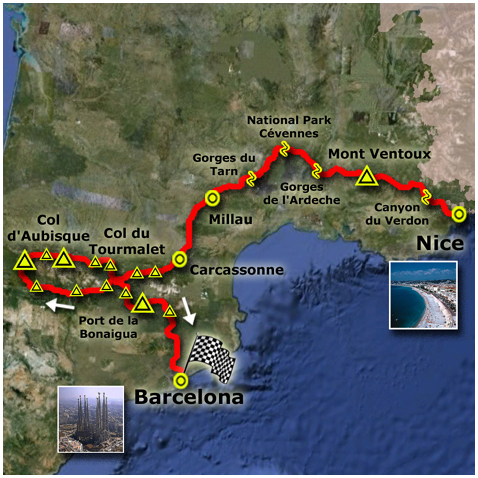 The course varies from serious hills to long, steep climbs as the Mont Ventoux and the Col du Tourmalet. Don't expect one single flat stage. The tour is planned at the start of the summer which guarantees some warm, even hot, cycling days in the middle of the Provence. If you come closer to the Pyrenees, the weather conditions can always be unsettled. The circumstances can become heroic if you reach altitudes around or above 2.000 metres. "La Grande Boucle des Pyrénées" is a physical challenge in an alluring and picturesque area. You want more, you can get more. Ride the climbs you always wanted to do, and enjoy the best of what Southern France and Northern Spain has to offer. Relax again on a terrace and watch the waves of the Mediterranean. This time in Barcelona. Request the Brochure of "La Grande Boucle des Pyrénées"